In early March, the bronze plaques which were installed to honor Alex Baum, were stolen from the Alex Baum Bridge. We just received news that two of the three plaques have been recovered! Here’s a little history about the man, the legend… The bronze plaques were installed to call attention to Alex Baum’s accomplishments and legacy in supporting bicycling as a mode of transportation and recreation throughout his lifetime. The first pair of bronze plaques were installed at the inauguration of the Baum Bicycle Bridge in 2002. Fast forward to 2012, and as part of a re-dedication of the Baum Bicycle Bridge on its 10th anniversary, the second pair of bronze plaques with biographical information about Mr. Baum were added. Just around the time City of LA’s longest serving bicycle-advocate Alex Baum (1922-2015) passed away on Sunday, March 1st, the three bronze plaques were reported missing. As you can imagine, our team was saddened to hear the news. A few days after the bronze plaques were stolen, South Coast Recycling contacted the Los Angeles Police Department (LAPD) to report that someone had tried to sell these bronze plaques to their facility. Luckily, the Center was able to recover two out of the three stolen bronze plaques. A third bronze plaque (like the one in the photo below) is still missing. LADP continues to search for the missing plaque. Anyone with information should contact LAPD. LADOT staff is currently in the process of installing the two bronze plaques returned to us by our friends at the LA Recycling Center. 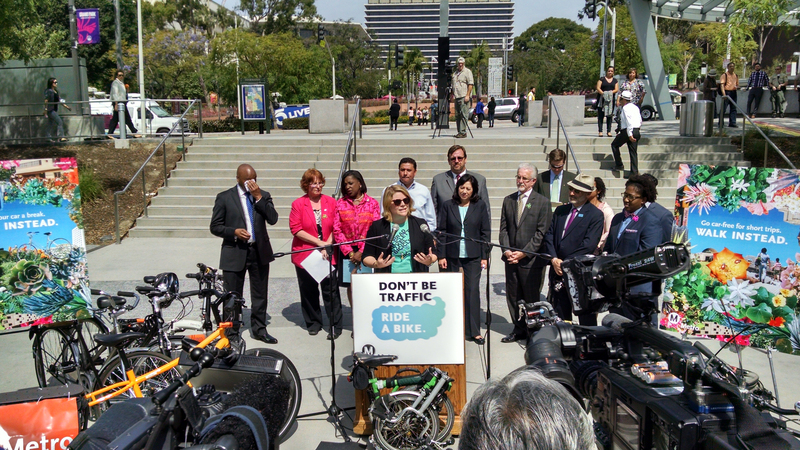 We know the stereotype that Los Angeles is a car city, that it’s not safe to bike, and that sometimes those that do bike can find it difficult to do so. 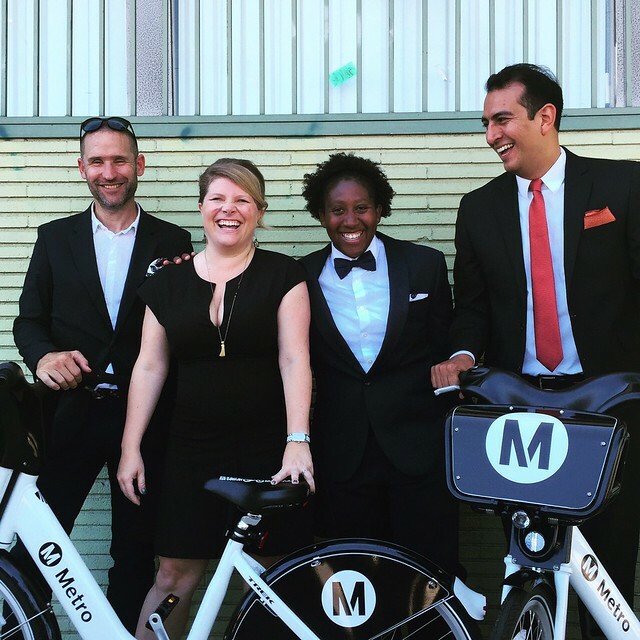 It’s why we at the LADOT Bike Program work hard to make our city a friendlier place for people on bicycles and why we’ve always got plans to expand our work. But sometimes there are devastating incidents that remind us of how much more work we have to do, and the many ways that we need to approach bicycle safety. Because bicycling safely in this city doesn’t end with a sharrow or a bike line – it’s also about knowing that if something were to happen to you the law would be on your side. That’s where Damian Kevitt comes in. Just over a year ago Damian was hit by a car while on his bike on Zoo Drive on the edge of Griffith Park. What could have been a minor accident turned very dangerous when the driver proceeded to flee the scene and entered the 5 freeway with Damian trapped underneath. To this day, the driver’s identity is unknown. 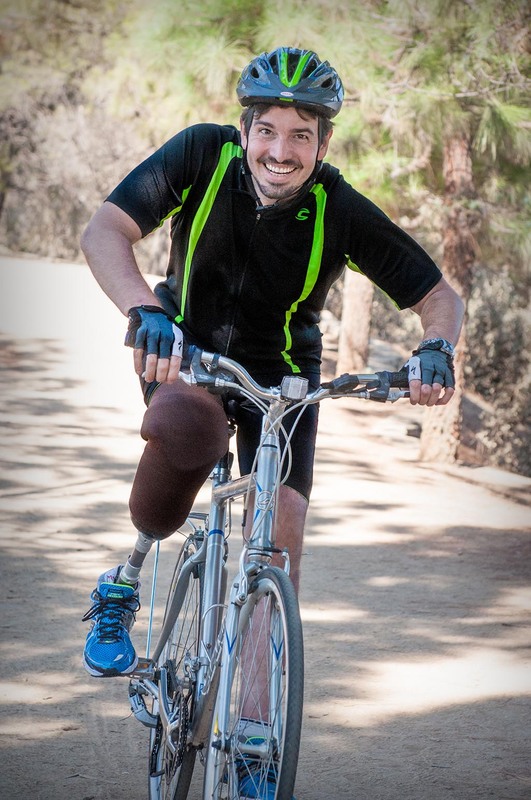 The seriousness of Damian’s accident is surpassed only by the height of his courage; within months Damian was back on a bike again, not only biking but also running and swimming, joining a community of athletes with similar physical challenges. There is no doubt that it takes a ton of resilience to come back from a collision like Damian’s; but it wasn’t enough for Damian to ride again on his own.“Too many people are losing their lives or being injured themselves because someone was unwilling to stop and render care….If I can do something that is going to prevent at least one other person then I can walk away from this feeling in some kind of bizarre way that it was worth it, that at least I accomplished something good out of it” he said. Just days after the incident and hours out of one of many surgeries, Damian promised to finish the ride, but not just for himself. 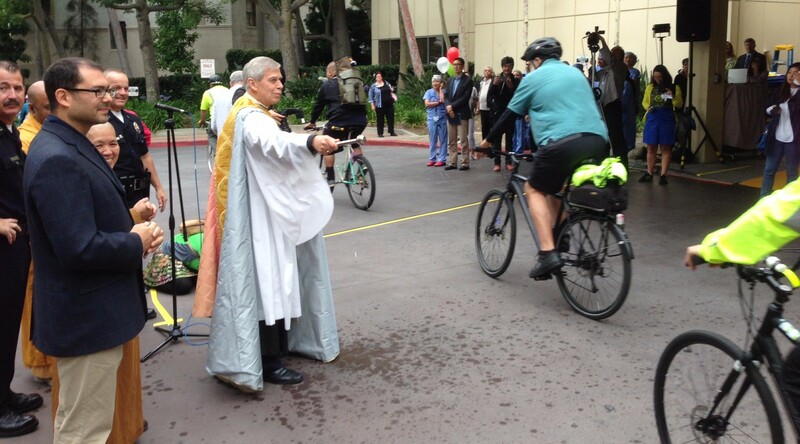 Damian became the catalyst for a movement of people in Los Angeles devoted to making the city is a safer place to bike. 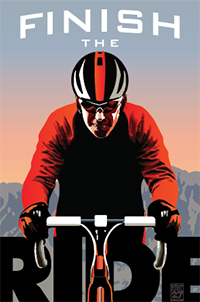 Finish The Ride, a joint effort of Damian, LA County Bicycle Coalition (LACBC), and Challenged Athletes Foundation (CAF), is happening on April 27th at 8AM. All proceeds benefit LACBC’s continuing hit-and-run campaigns and CAF. But as Damian explained, it’s “not that there’s a lack of solutions or even resources [to address hit and runs], there just needs to be enough pressure to make it a priority. Make it enough of an issue that is has to be confronted.” The more people that come out to support the event, the greater the visibility for the cause. If you can’t ride, you can volunteer. “It’s unfortunate,” Damian said, “that we have to legislate it in order to effect the change, but if that’s the necessary evil in order to prevent people who are unable to make proper moral choices than that is the necessary evil.” You can urge our legislature to increase penalties on hit and run drivers by signing the petition here. For our part, Councilmember Tom LaBonge has directed LADOT to work on identifying improvements on the Zoo Drive bridge. LADOT engineers are working with Caltrans to make safety improvements at the location and recently Caltrans re-striped the Zoo Drive bridge by placing double yellow stripes. Soon we will be installing delineators on top of the lines on the bridge that lead to the south bound entrance of the 5 Freeway, to further discourage drivers from crossing the double yellow lines and prematurely entering the freeway. Councilmember LaBonge is allocating funds from the CD-4 budget to ensure that the delineators will be installed for Finish the Ride. 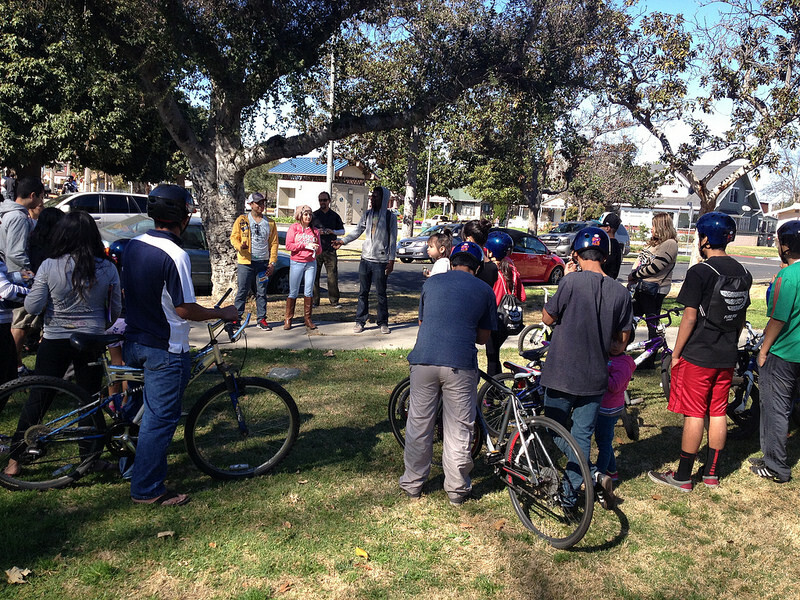 The Bicycle Program would like to thank all the people who attended Active Streets L.A. last weekend to talk about walking and bicycling in their neighborhoods. Using a large-scale image of the neighborhood’s street network, locals pointed out intersections with difficult crossings and areas that felt uncomfortable for bicycling. The event was a great opportunity to identify existing conditions and key opportunities for bicycle and pedestrian improvements around the Vermont Square Neighborhood. The insightful comments we received will help us plan where traffic calming measures such as roundabouts, bulb-outs and future crosswalk locations will be most effective. 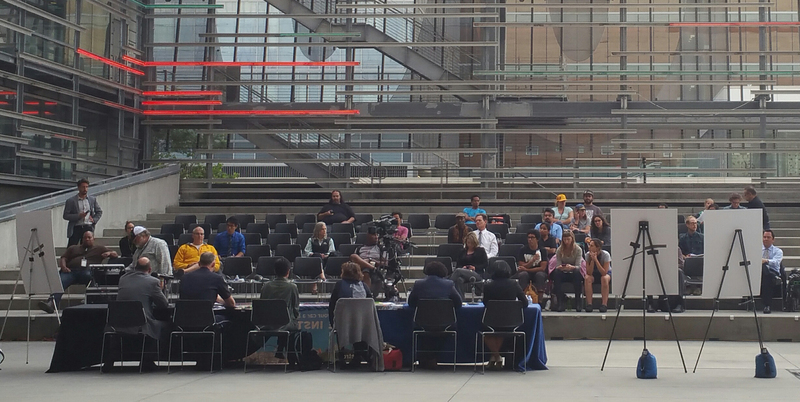 We look forward to hearing more greats ideas and comments at the next Active Streets L.A. event! 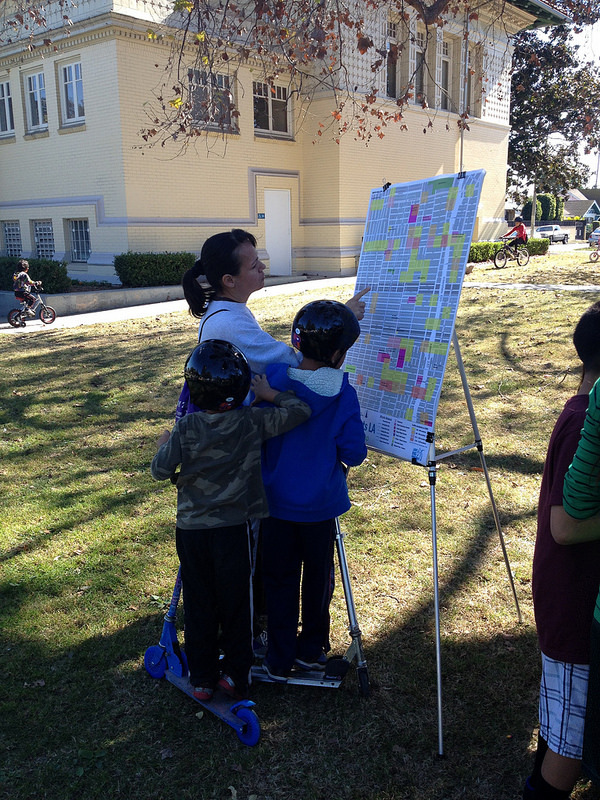 A resident uses a sticky note to indicate a difficult crossing on our map of the surrounding neighborhood. 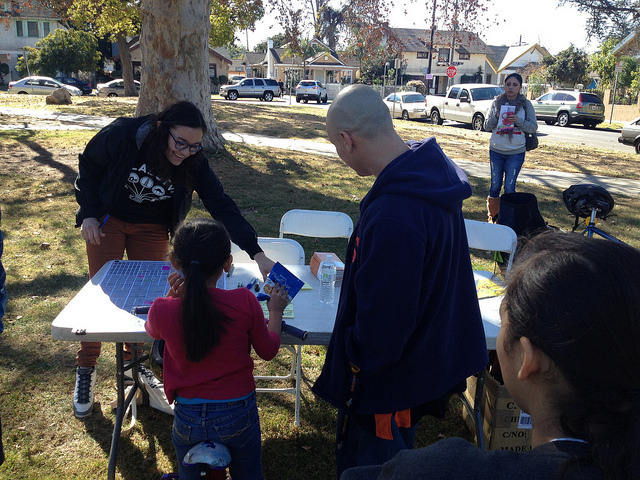 We received comments from residents of all ages! This family rode over on their scooters! The event had a great turnout! 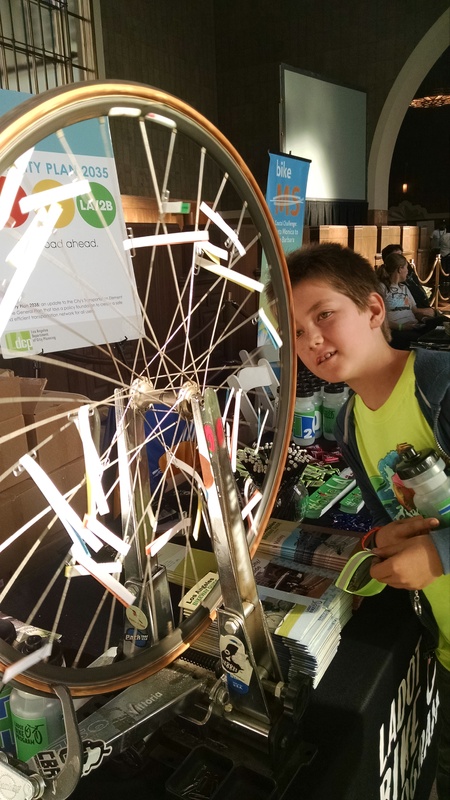 Visit us at the LA Bicycle Commuter Festival! 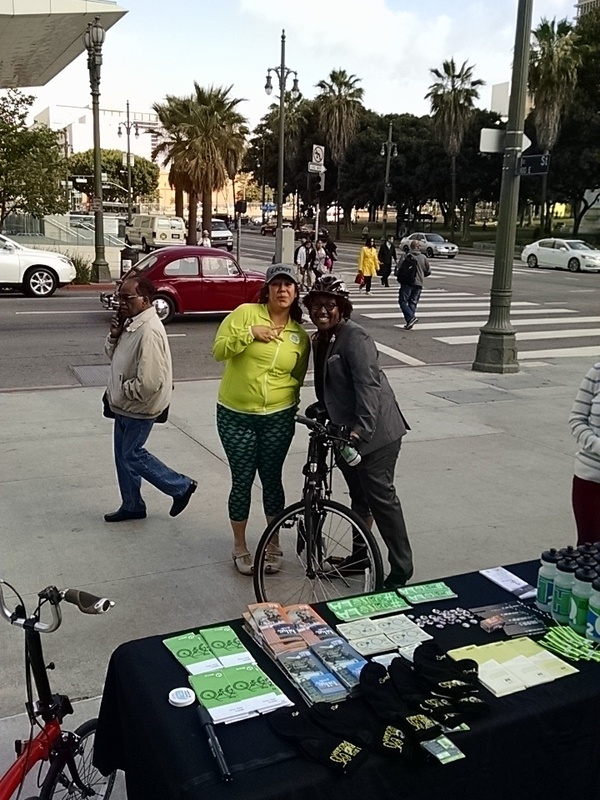 The LADOT Bicycle Program is excited to take part in the Los Angeles Bicycle Commuter Festival & Summit! 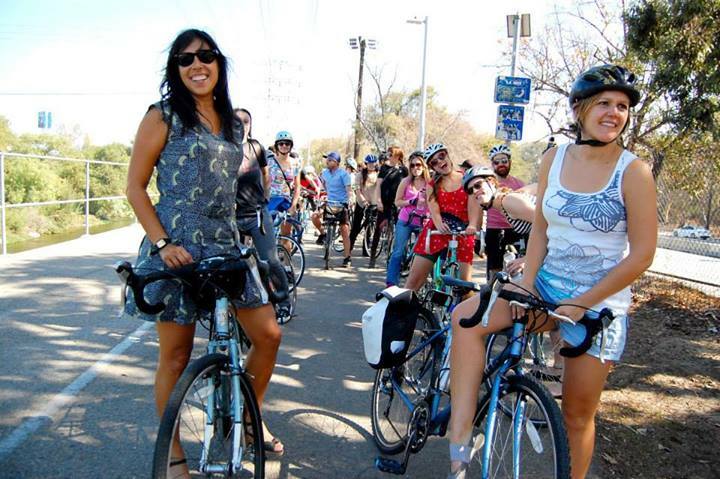 This day-long event is intended “to entertain, educate and connect the ‘bike curious’ of Los Angeles to the joys of riding bicycles for transportation.” The festival features workshops and information on the basics of biking for transportation, local bicycle advocacy efforts, group rides and all things Bike-L.A. related. 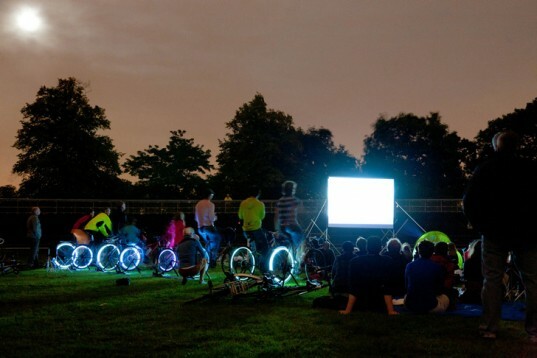 Workshops and panel discussions will provide a platform to exchange ideas and experiences with other bicycle commuters. 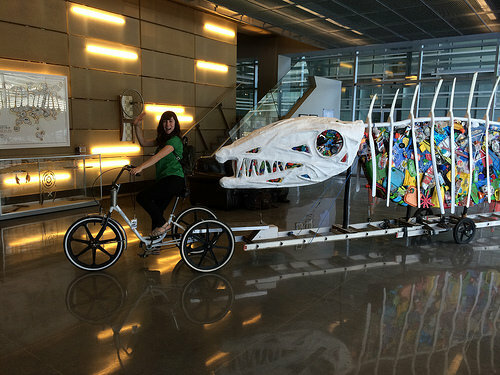 Visitors are encouraged to learn about new and existing resources to help make their bicycle commute a more enjoyable experience. In addition, there will be a number of cool bike vendors attending, a silent auction of bicycle goodies and a party immediately following the main event. 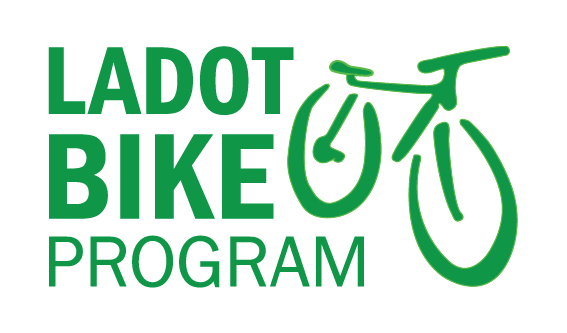 LADOT Bicycle Program will be at the festival with our usual collection of reflective ankle straps, lights, maps and other information. In addition, LADOT People St will be in attendance to answer questions and explain how residents can help transform Los Angeles’ streets into active, accessible public spaces through the implementation of plazas, parklets, and bike corrals. The festival takes place Sunday, February 16 from noon to 8 p.m. at The Village at Ed Gould Plaza at 1125 N McCadden Pl, Los Angeles, CA. Please note that this is a ticketed event; registration is $10 for individuals and $15 for families. See below for full details. Hope to see you there! 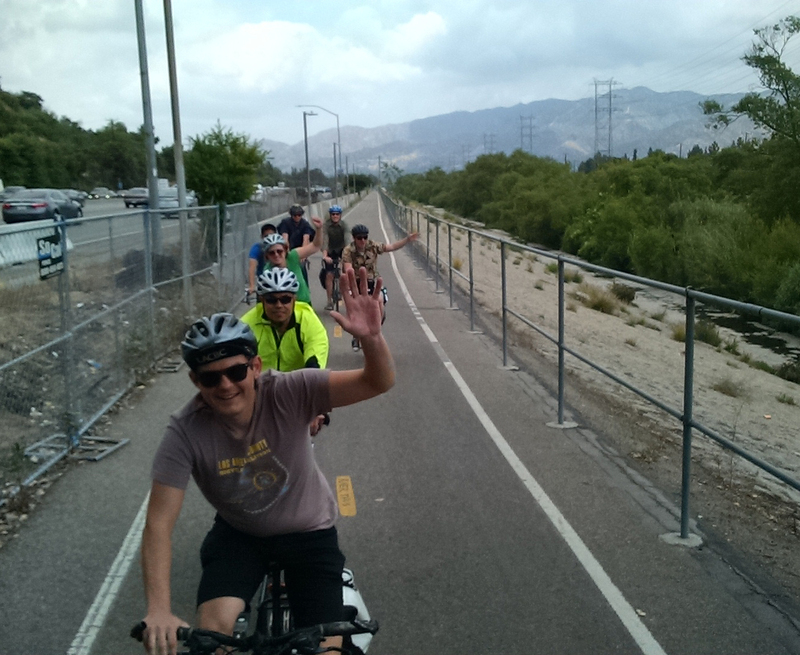 Back in September, we had our first public meeting with residents of Cheviot Hills and other members of the public about the Northvale segment of the Expo Bicycle Path. The purpose of the meeting was to gather public input from the community before LADOT begins to design the bicycle path. Receiving public input before designing the path allows us to better address the comunity’s concerns about the bicycle path. LADOT’s preliminary design will be communicated at a future public meeting. The Northvale segment of the Exposition Bicycle Path will be on the north side of the Expo Light Rail line between Overland Avenue and Motor Avenue, as shown in the image below. This path is being funded and constructed separately from the Expo Line and is projected to open in 2017. Many factors including steep hills, convenience, and cost were considered when locating the bicycle path at this site. 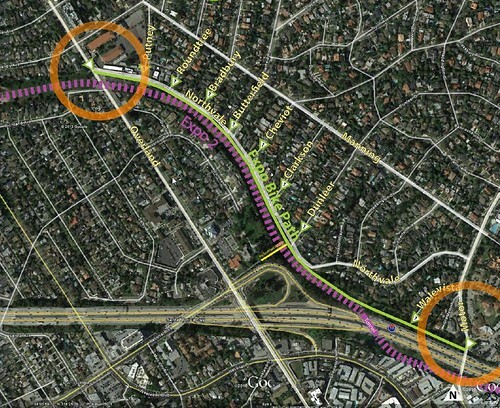 This path will not go under the freeway with the Expo Train because the existing tunnel is not wide enough for both. Widening the tunnel would be prohibitively expensive for the project. A site plan of the Northvale segment of the Expo Bicycle Path.